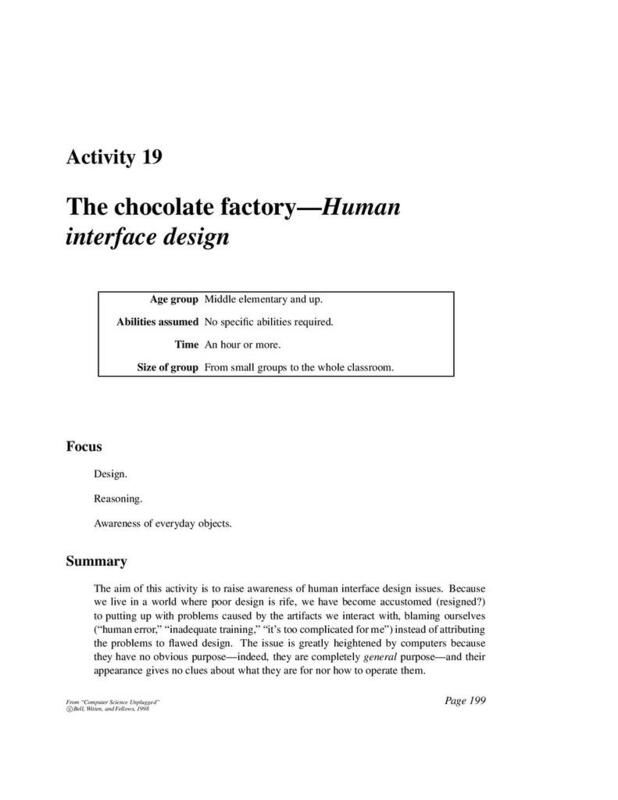 The aim of this activity is to raise awareness of human interface design issues. In a world where poor design is rife, people have become accustomed to dealing with problems caused by the artifacts with which they interact, sometimes blaming themselves instead of attributing the problems to flawed design. The issue is greatly heightened by computers because they have no obvious purpose, indeed, they are completely general in purpose and their appearance gives no clues about what they are for nor how to operate them. The resource begins with a detailed explanation of the activity, what to do and how to carry out the task with a class. There follows variations and extensions and further information about human-computer interaction followed by worksheets for use with the activity. This collection of twenty activities from Computer Science Unplugged is designed to aid the teaching and learning of computer science through engaging games and puzzles using cards, string, crayons and lots of running around.